Wife's final Christmas present to me arrived today. 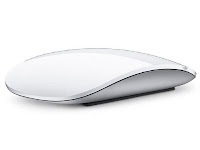 It's the new Apple Magic Mouse . It's a lot slimmer than the old one, the Mighty Mouse. But the thing I like the most is the "trackpad" feature. Apple calls it the "Seamless Multi-Touch Surface." It rocks. Wife, though, thinks my wanting a new mouse was silly. But, she got it for me anyway.